At Beanfields, we’re all about beans; one of the most sustainable protein sources in the world. When you buy Beanfields chips you’re participating in a lot of goodness. Good taste is only the beginning. 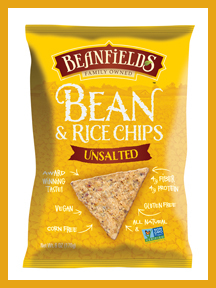 All Beanfields chips are Non-GMO Project Verified, vegan-friendly, and certified gluten-free. As you can see from this chart (source – American Pulse Association), beans (also called pulses) are by far the most water-efficient source of protein available. And they are also far below the 110 gallons of water needed to grow a pound of corn (source – The Water Footprint Network). Did you know that beans are the ONLY food that the USDA lists in two different nutrition categories? Beans are BOTH a vegetable and a protein source! That’s a lot of nutrition packed into those small little bean packages! Corn and potato – the most common chip ingredients – are mostly empty calories. But our bean and rice chips provide 5 grams complete protein, 6 grams of fiber and 4.5 grams of fat per serving, plus other essential nutrients. Using a guiding philosophy that we call kinder prosperity, Beanfields is setting up innovative business practices to partner with our key suppliers and to build a long-lasting business that benefits as many people as possible. That’s why we meet the requirements to be a Certified B Corporation, uniting with over 1000 companies globally to use business as a force for good. We are also proud members of organizations that promote positive social impact through business including Social Venture Network, The American Sustainable Business council, and Hub LA. Beanfields chips are first and foremost a great tasting snack. In fact, Beanfields chips have won numerous taste awards! Our distinctive crunch and delicious flavors will make us your anytime, go-to chip. And that's even before you realize how much better for you they are! 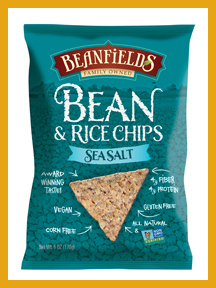 Beanfields Sea Salt bean and rice chips satisfy your snack cravings with every delicious crunch. They do it with four simple ingredients: beans, brown rice, safflower oil and sea salt. All Beanfields Snacks are Non-GMO Project Verified, gluten-free, and vegan-friendly. They contain about one-third less fat than most tortilla chips. One serving of Beanfields Sea Salt chips gives you 5 grams of protein, 6 grams of fiber and zero grams of sugar. Plus, Beanfields proudly makes every flavor of chip without corn or the eight ingredients recognized by the FDA as the top food allergens. Beanfields Nacho bean and rice chips will capture your taste buds with their bold, cheesy flavor. The chips are Non-GMO Project Verified, gluten-free, vegan-friendly and contain about one-third less fat than most tortilla chips. One serving of Beanfields chips gives you 5 grams of protein, 6 grams of fiber and zero grams of sugar. Plus, Beanfields proudly makes every flavor of chip without corn or any of the eight ingredients recognized by the FDA as the top food allergens. 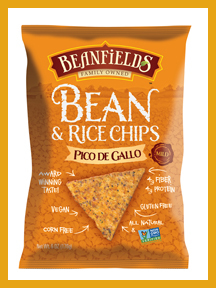 Beanfields Pico de Gallo bean and rice chips provide a mouthwatering, mild salsa flavor that’s perfect for parties and festive occasions. Beanfields chips are Non-GMO Project Verified, gluten-free, vegan-friendly and contain about one-third less fat than most tortilla chips. One serving of Beanfields chips gives you 5 grams of protein, 6 grams of fiber and zero grams of sugar. Plus, Beanfields proudly makes every flavor of chip without corn or the eight ingredients recognized by the FDA as the top food allergens. Beanfields Barbecue bean and rice chips deliver that backyard barbecue flavor and just the right amount of sweet and smoky goodness. Beanfields Snacks are Non-GMO Project Verified, gluten-free, vegan-friendly and contain about one-third less fat than most tortilla chips. One serving of Beanfields chips gives you 5 grams of protein, 6 grams of fiber and zero grams of sugar. Plus, Beanfields proudly makes every flavor of chip without corn or the eight ingredients recognized by the FDA as the top food allergens. 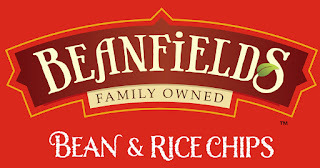 Beanfields Unsalted bean and rice chips are made with only three ingredients: beans, brown rice and safflower oil. Beanfields Snacks are Non-GMO Project Verified, gluten-free, vegan-friendly and contain about one-third less fat than most tortilla chips. One serving of Beanfields chips gives you 5 grams of protein, 6 grams of fiber and zero grams of sugar. Plus, Beanfields proudly makes every flavor of chip without corn or the eight ingredients recognized by the FDA as the top food allergens. Beanfields Ranch bean and rice chips deliver that tangy, creamy flavor many snackers crave. Beanfields Snacks are Non-GMO Project Verified, gluten-free, vegan-friendly and contain about one-third less fat than most tortilla chips. One serving of Beanfields chips gives you 5 grams of protein, 6 grams of fiber and zero grams of sugar. Plus, Beanfields proudly makes every flavor of chip without corn or the eight ingredients recognized by the FDA as the top food allergens. Beanfields Salt N’ Pepper bean and rice chips pack a flavorful punch that pepper fans can’t resist! Beanfields Snacks are Non-GMO Project Verified, gluten-free, vegan-friendly and contain about one-third less fat than most tortilla chips. One serving of Beanfields chips gives you 5 grams of protein, 6 grams of fiber and zero grams of sugar. Plus, Beanfields proudly makes every flavor of chip without corn or the eight ingredients recognized by the FDA as the top food allergens. Beanfields Bean & Rice Chips are absolutely delicious! I was a bit skeptical and wasn't sure what to expect from a chip made of beans and rice but boy are they yummy! I especially like that just one serving has 5 grams of protein, 6 grams of fiber and zero grams of sugar. I think that's amazing considering sugar is in just about everything these days. 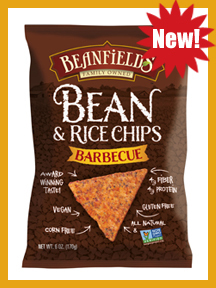 I really loved each flavor of Beanfields Bean & Rice Chips but my favorite would have to be the barbecue. Barbecue chips are my favorite in general, but I don't get them too often because they aren't very good for you. I'm so happy to have found a healthy alternative that actually tastes good. I strongly believe to live a healthy life these days it's all about finding healthy foods you actually enjoy. They're out there, you just have to find them! 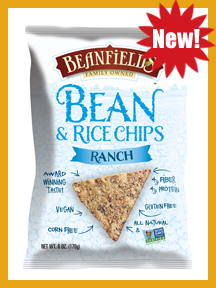 Beanfields Bean & Rice Chips are a perfect example! Click HERE to locate Beanfields Snacks at a store near you! Click HERE to learn more about Beanfields Snacks! Follow Beanfields Snacks on social media!